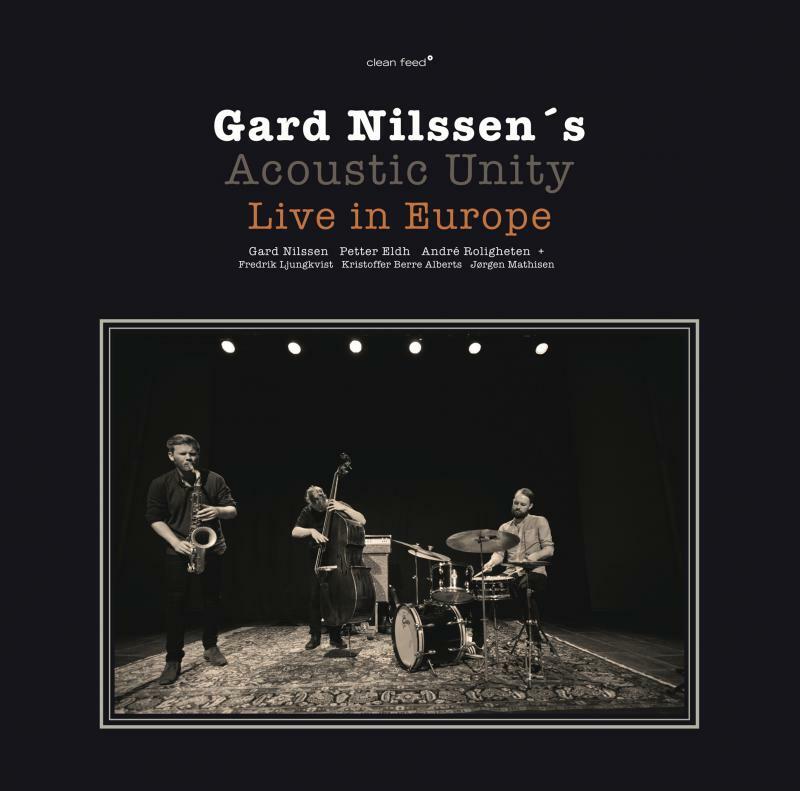 Gard Nilssen on drums, Petter Eldh on double bass and André Roligheten on tenor & soprano saxophones. Nilssen can be heard together with ‘Cortex Quartet’ & ‘Lord Kelvin Trio’, with ‘Zanussi 5’ and of course with his own ‘Acoustic Unity’ who’s album ‘Firehouse’ got a well-deserved shiny five-star review here 2 years ago. Nilssen's playing is full of vigor, swing and feeling and the connection with Petter and André is something out of this world, as you’ll see in the review. Petter Eldh on double bass is an artist, which seems to be all over the globe playing with lots of different artists. ‘Amok Amor’, ‘Django Bates Beloved’ are the two collaborations I’ve heard most of, but there’s lots more for those who like to dive deeper into the artistry of mr Eldh. And finally, we have André Roligheten, who’s album ‘Homegrown’ I reviewed recently. He can be heard in ‘Trondheim Jazz Orchestra’, his own band ‘Roligheten’ and ‘Team Hegedal’ – in which Nilssen plays the drums as well. Fredrik Ljungkvist on tenor saxophone & clarinet (On CD2, Ljubljana Jazz Festival) | I was so happy to see Fredrik contributing to this brilliant trio. One of my favorite albums from last year ‘And now the queen – a tribute to Carla Bley’, still gets a whole lot of playtime and his work with ‘Atomic’ is very much worth checking out. Kristoffer Berre Alberts on alto, tenor & barytone saxophones (On CD3, Oslo Jazz Festival) | Kristoffer can be heard with ‘Cortex’, ‘Damana’ and quite recently in a duo with Steve Noble. Jørgen Mathisen on tenor saxophone & clarinet (On CD3, Oslo Jazz Festival). Jørgen can be heard on the 2013 live concert album Jonas Kullhammar - Basement Sessions Volume 3: The Ljubljana Tapes (Clean Feed, 2014) , as a side note a highly recommended concert series from the Moserobie label owner, and former leader of the Jonas Kullhammar Quartet, Mr. Jonas Kullhammar himself. Mathisen can also be heard with ‘Zanussi 5’ (Ghost Dance, 2010) and with ‘The Core’. What we have here is a live triple album. Three recordings from the summer tour of 2016, with CD2 and CD3 also featuring a couple of additional musicians joining the acoustic unity giving us not only a trio, but a quartet on the second CD and a quintet on the third. Let me just say it straight up: this is a spectacular release. Across the 3 concerts there’s an intensity and creativity that takes hold of me from start to finish. We get to hear 7 of the songs 2 times and even 3, but as a trio, a quartet, a quintet or all 3; (When Pigs Fly (Trio and Quintet), Hymne (all 3), Roundtrip (all 3), Mormor (Trio and Quintet), Rushen (Trio and Quartet), Gammal Rottegift (Trio and Quartet), Zig Zag (all 3). This is a brilliant concept. As a listener I’m treated with hearing some of the songs being performed on different dates, in different cities & countries and as a trio, quartet and quintet. Nilssen has previously said that they always play without a set list and that songs are performed right off the bat. 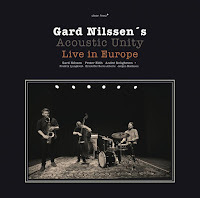 Having said that there must be a true telepathic connection between Nilssen, Eldh and Roligheten and I find myself nodding along and smiling when hearing great musicianship live on stage like this. On the three-minute-high-intensity song Zig-Zag I go from trio version directly to the quartet on CD2 and then to the quintet on CD3 and back again. It’s like having a mixer table and with the flip of a switch I can add and remove instruments. These guys don’t miss a note. There’s an aura of historical free jazz heroes like Ayler, Coleman and Cherry which is present across all three concerts, but at the same time melodies are being reinvented in new and unexpected ways, ideas thrown out and brought back in new shapes – and it’s all happening live! The first CD featuring “only” the trio comes out guns blazing with Nilssen leading the way. The first two tracks are filled with fire and intensity. First ‘When Pigs Fly’ which has this cool intro that the trio use to propel them into different directions of this relatively short tune. But what catches my immediate attention is the intensity of Nilssen which is an ever-present tour de force from the start. And then there’s ‘Hymne-Roundtrip’, which has a fantastic melody line which I’ll write more about further down this review. We will by the way hear this tune twice more on this release. Anyway it has this long and mystical bass solo lasting almost 4 minutes and I find myself turning the volume up to really submerge myself into the world of Petter Eldh. There’s a murmuring and almost soothing sound but he suddenly feels frustrated trying to find a way out. It reminds me of Keith Jarrett on the Bregenz-Munich release on part IV from Munich. Petter solves it very elegantly and brings the song to a close with a sigh… The trio picks up the pieces with the swinging song ‘Mormor’ (Grandmother) in which the spirit of Coltrane floats upon the beat of Petter and Nilssen. Very much needed after the start of this concert. The fourth track, ‘Jack’ is perhaps my favorite of all songs on this triple album. It has a long drum introduction which is equal parts searching and exploring, as it is building up tensions, intensity and swing! Sure enough, after 3 minutes the bass and brass joins in for a tune which has a dissonant yet funky rhythm. I absolutely love it! Towards the end the song trips over its own feet and goes into the Coleman-esque tune ‘Zig-Zag’ in which fierce free jazz intensity is balanced with elegance and dignity. It’s time to rest and charge our batteries. ‘Rushen’ provides such a space before we head into the final song of the first CD; ‘Gammal Rottegift’ (My Norwegian is not perfect but word for word I’d say it translates into “Old rat poison”. I’ll defer from interpreting it further than that…) An extended bass introduction suddenly explodes into yet another simple melody over rumbling drums. And then rhythm changes and the whole tune is dispersed and broken down to small pieces run through a blender and thrown out. But as I’m learning about this band I expect everything coming together again, and yes, they bring it home as a unity and the first concert is over! The second CD, recorded live at the Ljubljana Jazz Festival introduces saxman Fredrik Ljungkvist to transform the trio into a quartet. The first song ‘Summer’s Ale’ starts with searching and tip-toeing in which the musicians tries to find a common ground. Tension builds up, they’re balancing impatiently. And after about 2 minutes we’re off. After a rough swing there’s a calm break with a melancholic tune before the second round of variations on the theme and more free excursions. I love how Nilssen moves all over the drums to support the other musicians. It’s perhaps not improvised, but it’s full of spark and life. ‘Rushen’ is, as on the first CD, a calmer melody, searching, hesitating and wandering around. And so, for something different… ‘Gammal Rottegift’ (again) starts with a bass intro over 2 minutes. The band is invited to join with big orchestral aspirations. But it comes to a halt and instead the theme is chopped up in pieces. The underlying theme is dispersed across the soundstage and the quartet goes its separate ways. But like a stretched rubber band they find their way back to each other. They then charge all together full speed ahead until its time to close and finish. After an extended drum solo introduction ‘Hymne-Roadtrip’ presents a simple melody traveling over the carpet of drums, and it’s so infectious. I find myself whistling the melody when walking through busy European airports in Denmark, Italy and Germany. It’s hard not to. It’s like with ‘Lonely Woman’. It gets stuck in the system. The interesting thing is how the somewhat naïve tune fits so well with the dissonance from the much more intense rhythm section playing. Anyway, the melody and beat transforms into something different and new. The saxophones start to battle, one in each channel with bass & drums providing a stage for them to use. The theme comes back but spiced up and tweaked. For the closing of this great performance we’re treated with an extended bass solo which builds up intensity, twists, turns and spirals. It’s over. ‘Zig-Zag’. Boom, it’s Ornette – all-over the place but on ecstasy. But it very quickly comes to a halt. A few blips and blops and we’re off again. It’s a song that is lost with an uncertain direction. That’s okay, we can just hold on to our seats and go with the flow. In ‘Salad Days’ that closes the second CD I’m wondering whether the tracks title implies financial struggle. I must try and remember to ask Nilssen if I get the chance to see them live. If so, the character of the song fits well with the melancholy heard and it’s almost a bit hazy. Short unfinished melodies float in space exploring. Salad Days… OK. This is how salad days sound, I think I get it. On the third CD, from the Oslo Jazz Festival, the trio becomes a quintet and on the first track, ‘Hymne-Roundtrip’ – which I have now enjoyed in a trio and a quartet setting – is heard in full bloom. Coming out of the minute-long drum solo intro, the quintet gives me the melody that is now implemented in my jazz DNA. It has a perfect balance between the simple melody and the manic drums. After rolling and tumbling for about nine and a half minutes or so we are once again treated with an extended bass solo which also ends the song. It’s needed. I’m exhausted after hearing the quintet performing like this. There’s a seamless change into the second track ‘Mormor’ (Grandmother) which a slow paced funky piece with has been extended with 2½ minute from the version on CD1. The combination of these two songs is very interesting. I built a playlist with ‘Hymne-Roundtrip’ from both CD1 and CD3 played after each other and then ‘Mormor’ as trio and quintet. All in all 4 songs but heard as one. It’s a very rewarding experience. Anyway, onwards to ‘When Pigs Fly’. Again, it’s nice to hear this in a quintet setting. It has qualities that allows for the song to really take off when having several brass instruments playing. I’m not sure which one I prefer. It’s just two different experiences I guess, both great. ‘Utleiemegleren’ (I believe it means The Landlord in Norwegian), is a song that I’m still trying to understand. Slow pace, emotional yet with a bit of an edge. I’m never sure where it’s going. The concert ends with the 4½ minute long (short) sparkling ‘Adams Ale’ which is just a full-blown pack of energy building up to the inevitable end with the group throwing all they have out there. It balances on a thin thread throughout the performance. Madness or elegance? Badaboom. It’s over. This is my first five-star review on FJB, and it is very well deserved. This is one of the best releases I’ve heard this year and even in the last 2-3 years. Apologies for all the adjectives, but there’s just a whole lot of positive things to write about this release. It’s adventurous, it doesn’t stay in the middle at all. It transforms rhythms, melodies. It bends and breaks. It’ll go on my list for the best albums this year. Album can be heard on Spotify here, and bought as a triple CD or Vinyl+CD box set (January release) from Clean Feed Records. Excellent review. I can't wait to hear this since you guys made me aware of Firehouse plus I love most of the other related groupings, particularly Cortex. Great review. This is a quintessential live album and it's amazing how this sort of raw energy got captured here. It's so powerful that I can't really listen to Firehouse anymore, even though I absolutely love it!